Local tattoo parlors are seeing an uptick in fans getting ink to represent their fandom. KANSAS CITY, Mo. — With the Chiefs now one win away from appearing in the Super Bowl, fans are showing their pride in unique ways. For Eric “Cutta” Ross, the team’s success this season has led to a busy time at his hair salon in Overland Park. “We can do the arrowhead and paint it. We can do the Arrowhead and leave it unpainted. We can just do the KC in the middle of the arrowhead,” he said. 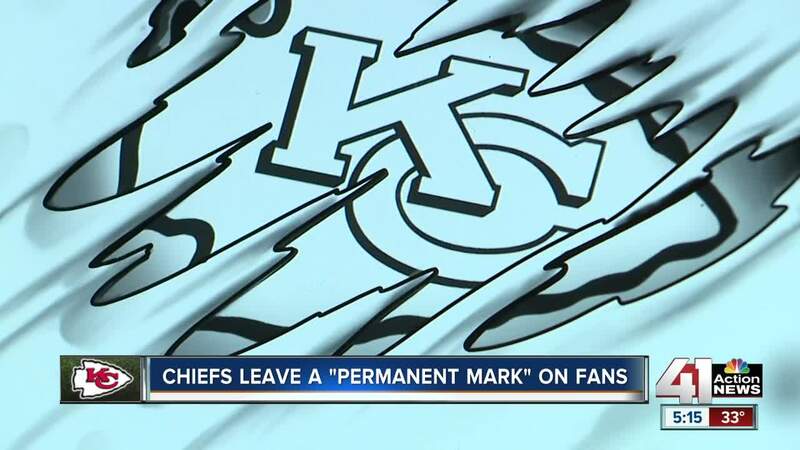 Ross shared with 41 Action News multiple pictures of special Chiefs designs he has cut on fans’ heads this season. Another shows a man with both a portrait of Travis Kelce and the team logo on his sides. “It takes radical customers to sit here and let me do what I want to do,” he said. For Ross, the increase in business this season reminded him of another time in Kansas City sports history. Other businesses around the metro have also reported seeing more Chiefs fan coming in over the last several months. At Skin Quest Tattoos in Westport, some have resorted to getting their body inked for the team or a particular player. Rittenhouse said many fans get the Arrowhead logo or a KC symbol tattoo. This season, he told 41 Action News that artists have even done tattoo portraits of Patrick Mahomes. Moving forward, Rittenhouse said the show of support for the Chiefs helped mark a special time for the city.